Why Does Your Dentist in Tulsa Love Fluoride So Much? The goal of your dental professional is to focus on solutions to help you navigate to greater oral health. Instead of focusing on dental problems, your dentist in Tulsa focuses on solutions and preventive care. In this post, we will explore how to stop tooth decay and remineralize cavities with…you guessed it: fluoride! Believe it or not, fluoride is a mineral that occurs naturally in many foods and water. This is one of the minerals that work to protect teeth from tooth decay and strengthens your smile’s enamel (protective layer). Bad dental bacteria that can be found in plaque produce acids that are harmful to your smile. They seep into your tooth’s enamel, causing it to weaken over time. 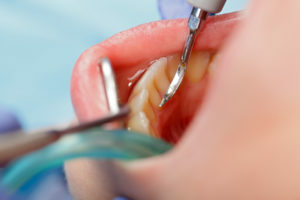 This process of breaking down enamel is what leads to cavities after so long. Where plaque breaks down enamel, fluoride builds it back up! Fluoride also helps repair tooth decay in its initial stages by building up the tooth’s protective layer in a process called remineralization. This cavity-fighting mineral even reduces the ability of plaque bacteria to produce acid from the very beginning! Fluoride can be directly applied to the teeth several ways. Patients can increase their fluoride intake by using a special fluoride toothpaste or mouthwash. Your dentist also offers fluoride treatments that are directly applied to your teeth. Getting a fluoride treatment periodically by a professional is important because it contains a higher concentration of fluoride than over the counter products. Exposure to fluoride can be especially beneficial for infants, children, and adults alike. We especially recommend if your child is between six months and 16 years old. Consider making these treatments incorporated into their normal dental visit routine. Because their teeth are still developing, it’s important to protect them from tooth decay and cavities as much as possible. Adults need cavity protection, too. Fighting tooth decay is just as important as strengthening a child’s developing teeth. Fluoride treatments will help you do that even after your permanent teeth have come in. High-risk dental patients can especially benefit from fluoride treatments. For example, if you have chronic dry mouth, gum disease or a history of frequent cavities, your dentist will recommend additional fluoride treatments during your appointments. Do you still have questions about how you can prevent yourself and loved ones from developing cavities? If you want to learn more about fluoride, reach out to your dentist for assistance. Dr. Angie Nauman has experienced the effects of having a dental problem, her’s being crooked teeth. After experiencing what dentistry could do for her by correcting her crooked smile and boosting her confidence, she decided that providing other people the same joy would be her goal. Since then, Dr. Nauman has taken pride in providing excellent, well-rounded dental services to patients of all ages. If you would like to discuss what Dr. Nauman can do for you and your smile, call Glisten Dental at (918) 254-8686. Comments Off on Why Does Your Dentist in Tulsa Love Fluoride So Much?